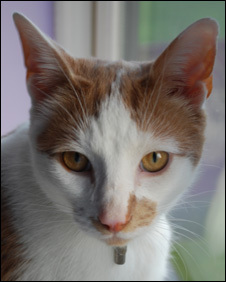 George the Cat, a clever orange and white tabby in the U.K., has figured out that the best way to get all the tuna juice and Tempations he wants is through hypnosis, and thanks to his owner, he’s accredited as a hypnotherapist. George’s owner, Chris Jackson, registered George with the British Board of Neuro Linguistic Programming (BBNLP), the United Fellowship of Hypnotherapists (UFH) and the Professional Hypnotherapy Practitioner Association (PHPA). Each accepted a certificate from the non-existent Society of Certified Advanced Mind Therapists as proof of George’s credentials. The UFH later admitted the mistake, which it said has since been corrected. A PHPA spokesman said the organization makes great effort to ensure every applicant is a fully-qualified hypnotherapist. George could not be reached for comment.